Have you ever struggled to accept the gifts God provides? 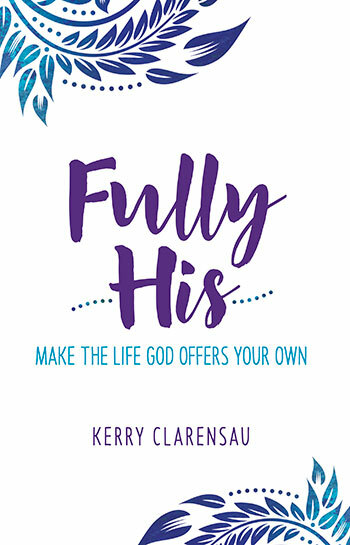 In Fully His, Kerry Clarensau will help you understand not only the promises He offers to those who believe in Him, but practical ways that you, as His child, can embrace those gifts. This thirty-day devotional journey alternates between exploring His promises on odd days, and discovering how to accept and embrace what He provides on the following even days. Featuring space for daily journaling, Fully His is the book you need to tap into and understand God’s provisions. Also available in Spanish, Plenamente suya. Kerry Clarensau is a speaker, mentor, author, and inspiring leader for women. She and her husband, Mike, were pastors of a culturally diverse church in Wichita, Kansas, prior to Kerry becoming the director of the National Women's Ministries Department of the Assemblies of God. Currently, she serves as the director of Women’s Ministries for the North Texas District Council of the Assemblies of God. Kerry is passionate about helping women apply God’s Word to their lives in practical ways. She is the author of Selah, A Beautiful Life, Redeemed, Love Revealed, The Love Revealed Challenge, and Secrets.